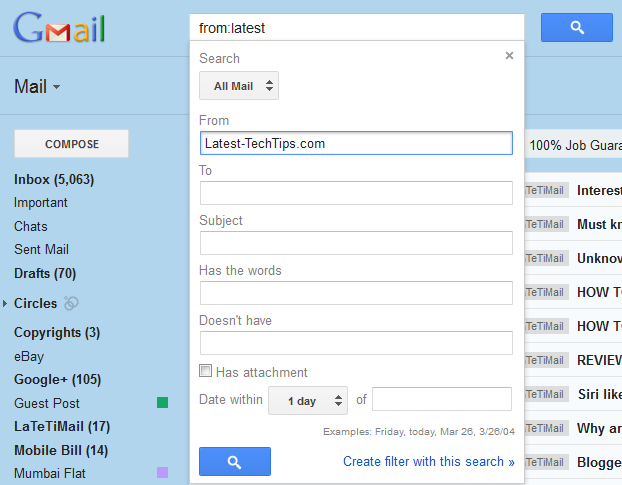 Home Gmail Tricks How to HOW TO: Enable Advance Gmail Search in 1 click? HOW TO: Enable Advance Gmail Search in 1 click? Many times we want to search email in gmail and are not very much familiar with the tags used for searching. Many people prefer specific category search boxes for searching their emails. If you are one of them then well in that case your prayers are answered today. Gmail has a very new feature which lets you search for your emails in an advance and precise way. 1. All you have to do is check the down arrow at the right of the search box in gmail. 2. Simply click on it and you will see Advance gmail search options. 3. Fill in your search criteria and just press the search. There is a check box even to search emails with attachments. This way you can search mail which you are actually looking for.